A short, easy-access walk on Mount Vernon with grand views across the city of Christchurch. Lamar Track • By Matthew. Licence: C.
Car park on Summit Road east of Dyers Pass Road. 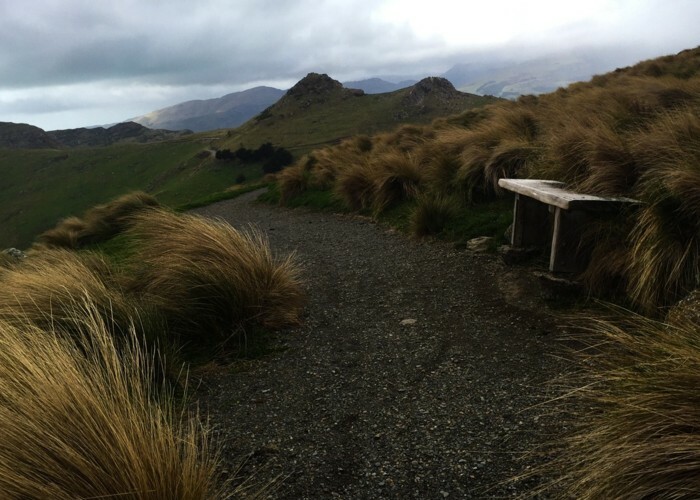 This short loop is located at the top of Mount Vernon Farm Park on Christchurch's Port Hills. With no steps, a wide gravel surface, and regular seating, it is designed to be an accessible track open to almost everybody. Driving east from the Sign of the Kiwi junction, watch for the Mount Vernon Reserve sign. Beyond here, the car park is on the left, and the track is through a gate. The track wanders through tussocks and rocky outcrops, forming a loop. A sort detour in the middle leads to seating with a plane table picking out surrounding hills. Near the end of the track, a memorial pole marks the location where a young boy died of hypothermia on the hill in 1883. The pole is one of two, with the other a little lower down by the Rapaki Track. Added 20 September 2015 by MatthewMatthew. 1 revision 20 February 2017 by MatthewMatthew.